Samuel Girard of Canada falls behind Sjinkie Knegt of Netherlands. The Netherlands has won eight of the 12 speed skating medals at available so far, including all four golds. Nuis, the first reigning world champion to win Olympic gold in the distance, made a blistering start and finished in one minute 44.01 seconds despite losing speed on the final lap. "I can't even describe the feeling, it's really weird," he told reporters. "I have to calm down just a little. I'm okay, I'm really, really happy." Paired with Japanese skater Takuro Oda, Nuis came out of the first turn trailing his opponent and falling behind made him push harder in his opening lap. "When I was entering the first turn and I saw him come out first, I was like 'Hey, what's this guy doing? '," the 28-year-old added. "I gained some speed and we both did a really good first lap. "It really helped me get in the race and I had really good first crossing thanks to him." Denis Yuskov, who holds the world record in the 1,500m, is not at not at the Games as part of the fallout from the Russian doping scandal. "Last year I was racing (Yuskov) here and we had a really good race," Nuis said. "I enjoyed racing him and it was nice to beat him last year. Today I had to do it all by myself and it was also a good race. Did I miss him? No." Skating in the fourth pair of the evening, 22-year-old Roest set the time to beat, powering across the line in 1 minute 44.86 seconds before facing an anxious wait of more than an hour to see where he would end up. "It was not fun. It was very nervous for me," Roest said after his Olympic debut. "It was hard. I sat with my family and I was watching all the races. Some of them came so close, I was so nervous." Racing after Nuis, Kim responded to the cheers of the crowd with a huge effort and made a late surge in the last two laps to finish 0.07 seconds behind Roest for third. "When passing 700 metres my legs were stiff and I was panting really hard," he said through an interpreter. "But I think the cheering from the fans motivated me a lot. "This Olympics is held in Korea so I practised really hard. I didn't expect that much but I'm really happy to get this result." 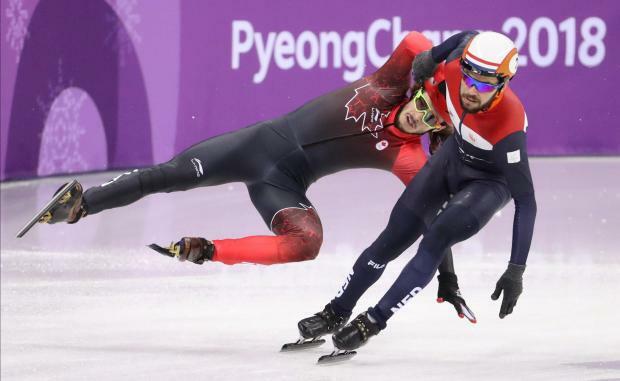 The United States endured another tough day on the ice and are still without a medal after four races, with Joey Mantia finishing eighth, and Brian Hansen and veteran Shani Davis 15th and 19th respectively.